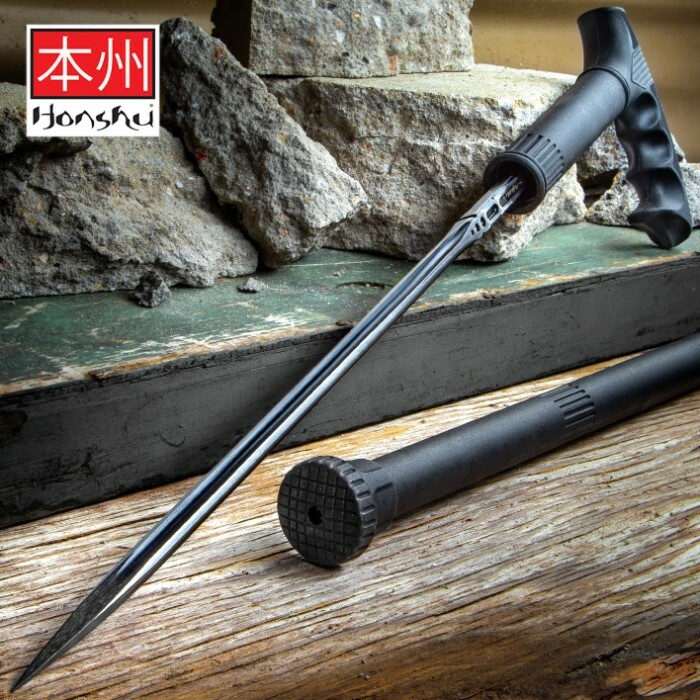 This unassuming sword cane is a beast when it comes to self defense! It offers a strong, partial crook handle constructed of injection-molded fiberglass-reinforced nylon composite for a strong, sturdy grip. The 16 3/4" blade is cast from 2Cr13 stainless steel with a satin finish and piercing point for deep penetration. It is very similar in design to United Cutlery's popular "Urban Stinger" daggers, but on a larger scale. 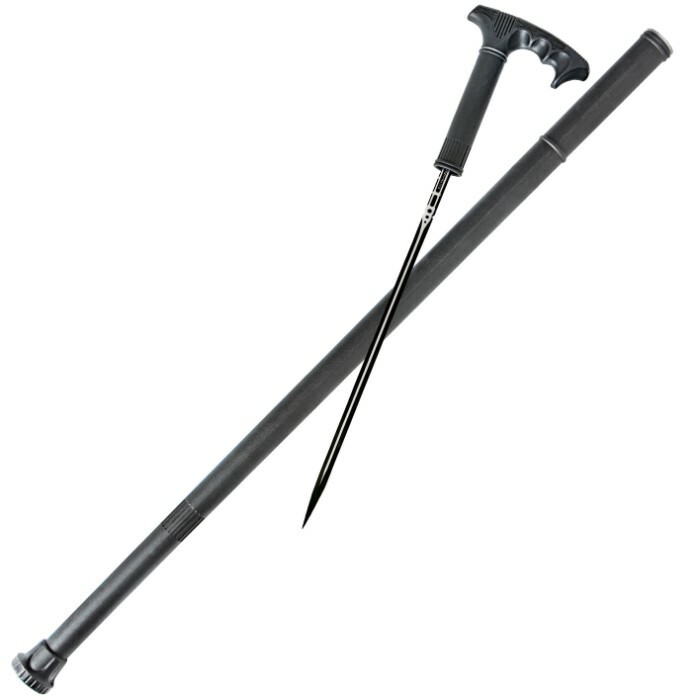 The ultradurable, sturdy shaft is built just as well as the handle, making this sword cane virtually indestructible! The end of the shaft also features a rubber tip, making it easy to navigate through icy streets and uneven sidewalks. 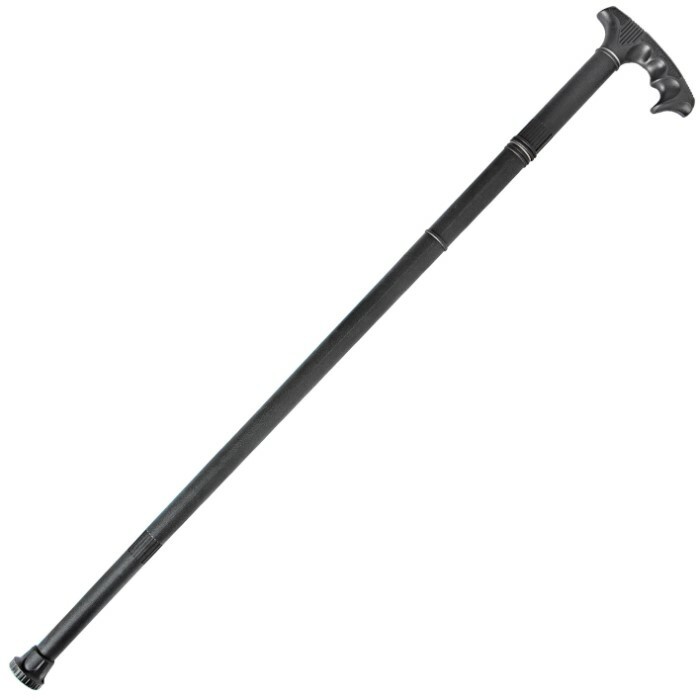 I've tried making my own sword canes but nothing ever came close to this sword cane. Beautifully plain looking but strong and surprising light. I received this just today and I was a little disappointed that I didn't have any sharp edges oh, so I'm still keeping it I spent the last 4 hours grinding it down to a sword with a hellacious tip. When I say I spent four hours on the grinding wheel, I had to use that time to break down this piece of Steel. It is almost impossible to bring it to a sword's edge, but I've got some equipment that helped me. This thing can slice paper and of course it can still go through pretty much anything that you want to stab. I am very happy with the sword and also now the improvised sword. This thing is heavy don't be misled. I walked my dog this afternoon and I was tired when I got back and I'm usually not, but the sword was that heavy it wore me out. Nice for the price but it is real heavy. I am 75 years old and it is heavy for me to lift. I ordered the Honshu Sword Cane-Wow it arrived earlier than said ,right to my Apartment Door,which is rare ,and Thanks for the fast service,And The Cane was awesome everything,was tight the washers were sealed so when you pulled the Sword out it all fit snug,and the Sword was tight and didn't rattle,heavier than it looked,I was really impressed.Thanks for the Great Service,especially at Christmas time. Pros: Well made. Bought it because of the great price and design feature. 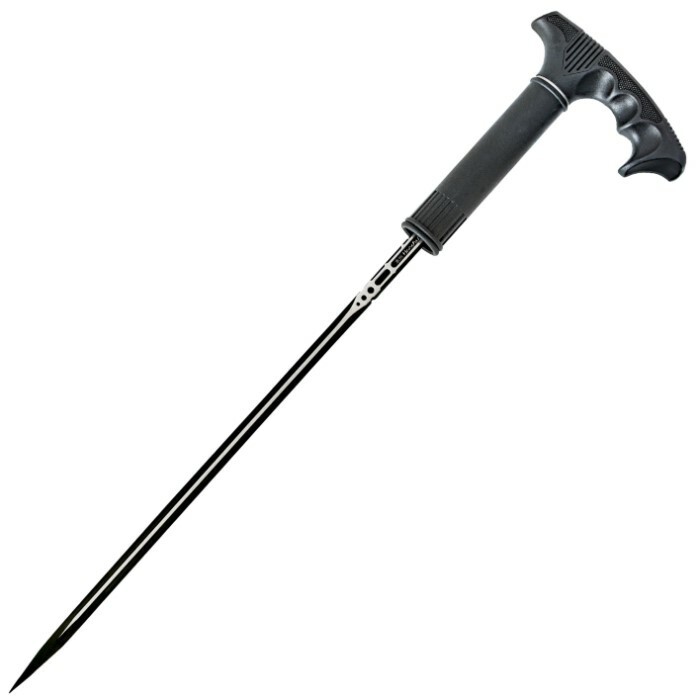 Liked the grip Cons: Very heavy for a walking cane, around 3 lbs.. No weight was given in the listing. Shaft is bulky looking.. Cumbersome and hard to handle and walk with for an 85 year old. Would be nice if it were thinner and lighter weight. More of a collector item than a practical cane. I will keep it as a collection. 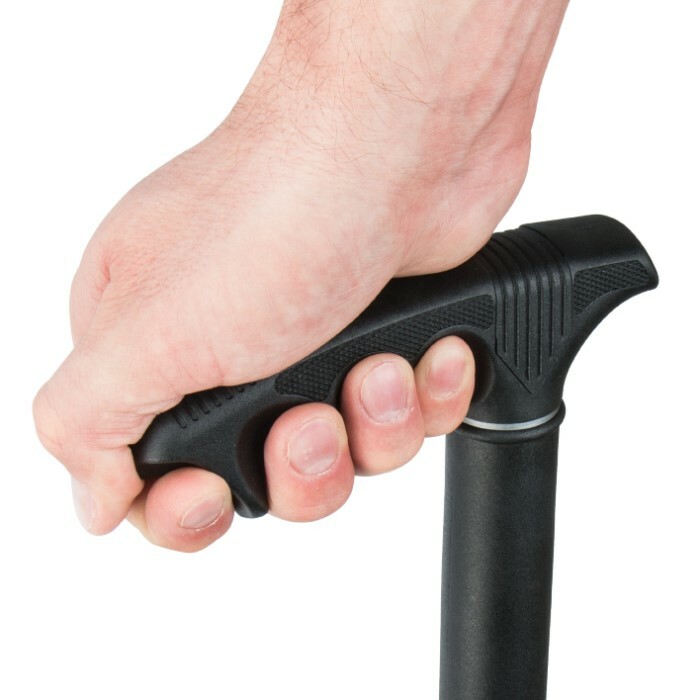 Nice cane, well made, but the handle is made for small to average hands. It is solid molded nylon, so I used a sanding drum to re-contour the grip. Much better, but could still use a larger handle. This cane sword is very well made. The only thing I wanted to do (didn't really have to) was to change the o-rings on the upper shaft so the handle would fit a little more snug. Everyone I showed it to said it was very well made also. And we all like the fact that it is more like a dagger, than a long sword. It has a little rattle as you use it as a cane, but a small o-ring slipped onto the dagger takes care of that. Buy one, you'll love it.